As we turn the calendar from 2010 to 2011, the aerial mapping market continues to be in transition across the board. Here I’ll consider developments that are gaining steam and others just introduced, and I’ll speculate about how some of them introduce us to challenges and opportunities. The pace of change in this industry is rather astonishing. A mere decade ago, aerial metric mapping was still predominantly done using film, and fewer than 40 lidar systems were in operation. Today, aerial metric cameras are predominantly digital, and the number of lidar systems in operation is five times what it was at the beginning of the decade. In addition, the spatial resolution captured by these systems has increased rapidly. Seemingly on another front, in the last decade cellular phones that can access the internet became commonplace; as a result, IT (information technology) departments have had to add mobility to the list of “ility” requirements: availability, reliability, scalability, and interoperability. I think interoperability and mobility (wireless) will have tremendous impact on our industry in the next year or two. Together they will enable any-time-any-place services, improved procedures for field data collection, and improved capabilities for first responders. In that same decade, Bing Maps, Google Maps, MapQuest and Yahoo! Maps have made the advertising model for delivering maps to consumers highly profitable on the internet (whether accessed from a desktop or on the go), forcing us all to consider a key question: Who pays us to make maps? Because computer technologies now make archiving, cataloging, and distributing images and maps relatively easy, many customers can now use the same images and maps, if we make changes in our business models along with the changing technology. This challenge suggests that imagination and a bit of daring may be well rewarded: Who will envision and implement the most successful business models for our new technological realities? The capabilities brought to market by the gaming community also affect us: Expectations for rendering speed and for the realism of three-dimensional models are higher in the workforce that grew up familiar with what gaming offers. Increasing spatial resolution helps increase the realism of 3D models; this links back to my earlier comment about the increasing resolution available from airborne systems, and we can speculate that it will increase demand for airborne data collection. However, for applications that do not require the model to be up to date, one acquisition might serve many more customers, and again the business model will be important. Increasing spatial resolution is accompanied by demands for greater locational accuracy. When spatial resolution was 30 meters (Landsat TM, for example), placing it on the ground to within 15 meters of its true location was pretty good. In contrast, 15-meter locational accuracy is not satisfactory when spatial resolution is, say, 30 centimeters. Historically, assessing the locational accuracy of aerial imagery has required, in addition to ground survey of numerous identifiable image points, several days’ worth of work in the office to create a spreadsheet of all of the coordinate pairs for the check points in the imagery and on the ground, calculations of the errors in x and y, and the laborious creation of a report. A consequence has been that the accuracy assessment of the orthoimagery has not been required when project budgets have to be as economical as possible. A recent development significantly changes what is possible and will enable the mapping community to systematically assess the locational accuracy of all orthoimagery: Accuracy Analyst software from Spatial Information Solutions calculates the accuracy and automatically generates a report in a few hours, not days. 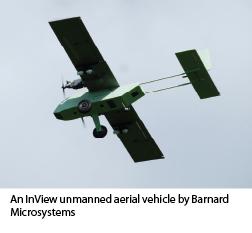 Unmanned airborne vehicles (UAVs), which are now being used in the wars in Iraq and Afghanistan, may also gain acceptance for civilian uses in North America. Those familiar with the history of aerial mapping know that the field started in the military and became established in the civilian world when surplus military aircraft were available “for a song” and service personnel who had skills in airphoto interpretation returned to civilian life. In order for UAVs to be operated in the U.S. National Airspace System outside of “restricted” airspace, the U.S. Federal Aviation Administration (FAA) currently offers only one option: a Special Airworthiness Certificate – Experimental Category. This does not allow operating for hire, only for “research and development, market survey and crew training.” The number of applications for certificates has been increasing, with operators interested in using UAVs for aerial photography, crop surveying, environmental monitoring, and border and port protection. The FAA plans to publish a proposed rule regulating small UAVs in 2011. This will be a business threat to some members of the aerial mapping community and an opportunity for others. What I expect to be one of the most significant changes affecting the mapping community was announced November 19, 2010: the US Office of Management and Budget (OMB), in its reform of government, will require “cloud first” solutions beginning with the 2012 budget. Any effective secure solution available in the cloud will be selected in preference to any equivalent solution not in the cloud. Because so much mapping activity in the United States is federally funded, such a change by our main customer is sure to have ripple effects on how everyone involved in aerial mapping does business. What is “the cloud” and what good is it? The name is said to come from early graphic representations of the internet as a cloud. Cloud computing is a shorthand expression for technological capabilities delivered on demand over the internet, rented when needed. The two main capabilities of interest here are data storage and software as a service (SaaS). Thus the cloud allows a mapping company to “scale up” its data storage as an operating expense for the duration of a project and scale back down and up again quickly and dynamically as projects go through various phases with different data storage requirements. This will allow aerial mapping firms to bypass the need to make capital investments to accommodate the busiest times of year, only to see the resources sit idle at other times. Some of our colleagues are already storing data “in the cloud”; examples include WeoGeo and SpatialCloud.com, both based on Amazon Web Services. With SaaS, companies and government agencies access software systems over the internet instead of buying licenses to install software on specific machines in the office. As with data storage, this allows a great deal of flexibility. Examples of SaaS in the mapping world include Esri’s Business Analyst Online, GeoMapper from Geo.Me Solutions, and geoPort from Gecko Information Systems AS. Moving to the cloud does carry risks to security and privacy; that’s why the OMB announcement mentions “secure solutions” in expressing a preference for cloud-first solutions. In addition, an educated consumer will want to consider carefully such issues as liability and recourse, the geographic location of off-site backup, intellectual property issues, peak-cloud capacity, and how freely you will be able to move to a different cloud provider if you want to. The pace of change in so many aspects of aerial mapping means that the competencies needed by our workforce continue to evolve, too. In July 2010, the U.S. Department of Labor released the Geospatial Competency Model to provide guidance to people beginning a career in the geospatial industry. Secretary of labor Hilda L. Solis said, “The geospatial model serves as a guide for those who want to both find a good job and map out a long-term career pathway in any of several geospatial technology fields including surveying and mapping, computer science and information science.” The model is the result of a great deal of work by many people, and it deserves to be studied and used (see the Education in Surveying column in the August 2010 issue of Professional Surveyor Magazine for more details). Many kinds of competencies contribute to the geospatial field, and this document can help people find where they fit, whether in early career stages or seeking mid-career renewal. Dr. Tina Cary is founder and president of Cary and Associates, a marketing firm in Longmont, CO specializing in geospatial technologies.